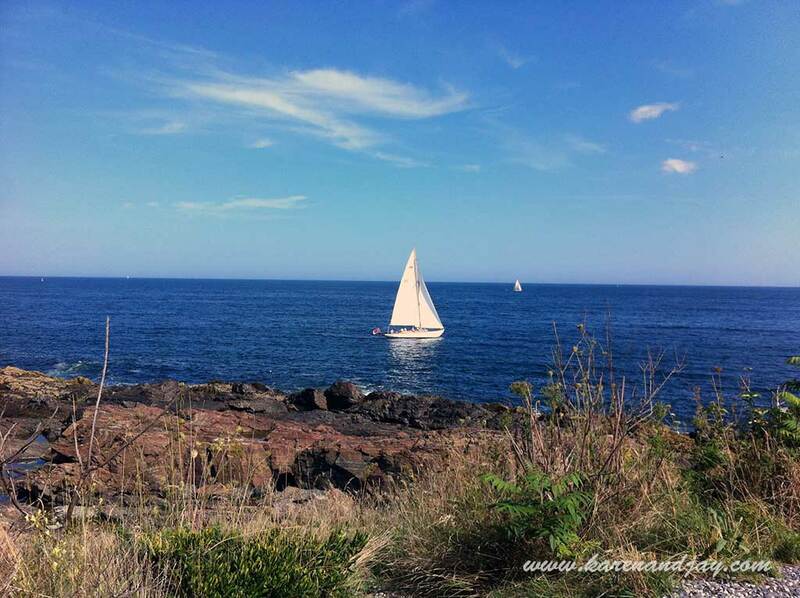 Since we really didn't get much of a vacation this year, I booked a room at the Admiral's Inn for four days by the ocean in Ogunquit, Maine. 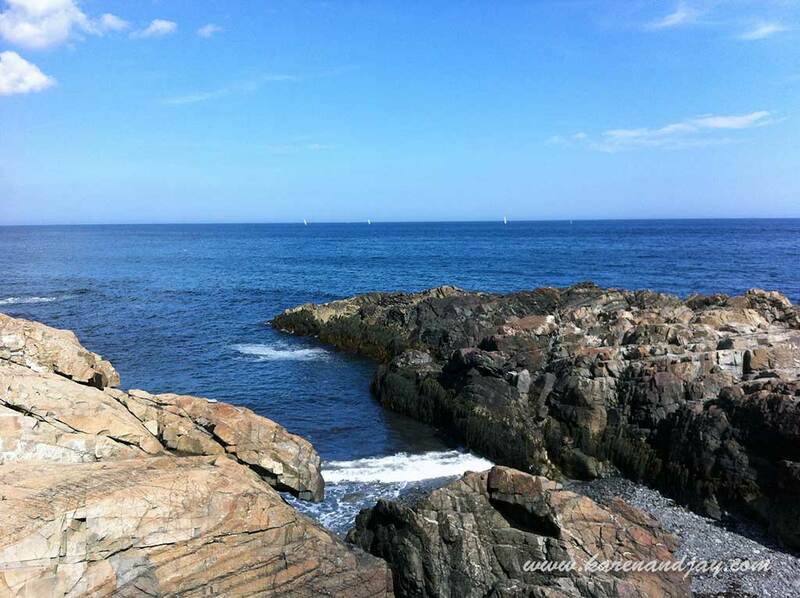 We spent our first day relaxing on the beach and walking along the famous Marginal Way and the charming Perkin's Cove. Karen had a delicious lobster roll. It was basically a way to take in the quiet beauty of the water, clear our heads and chill out. 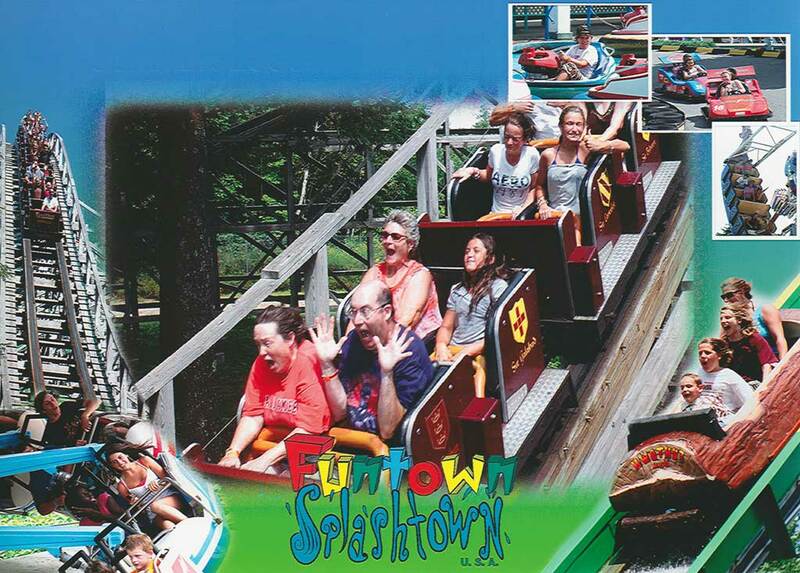 For our second day, Karen suggested we take a short ride north to Saco and spend the day at Funtown/Splashtown. We had been there nearly a decade ago and really enjoyed it. So we couldn't resist the opportunity to see it again. 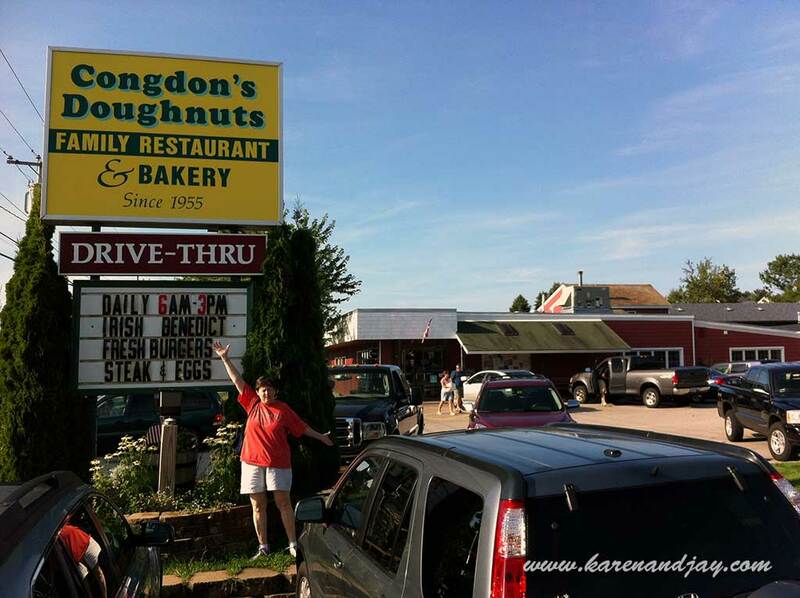 On the way there, we stopped for breakfast at the famous Congdon's Doughnuts. 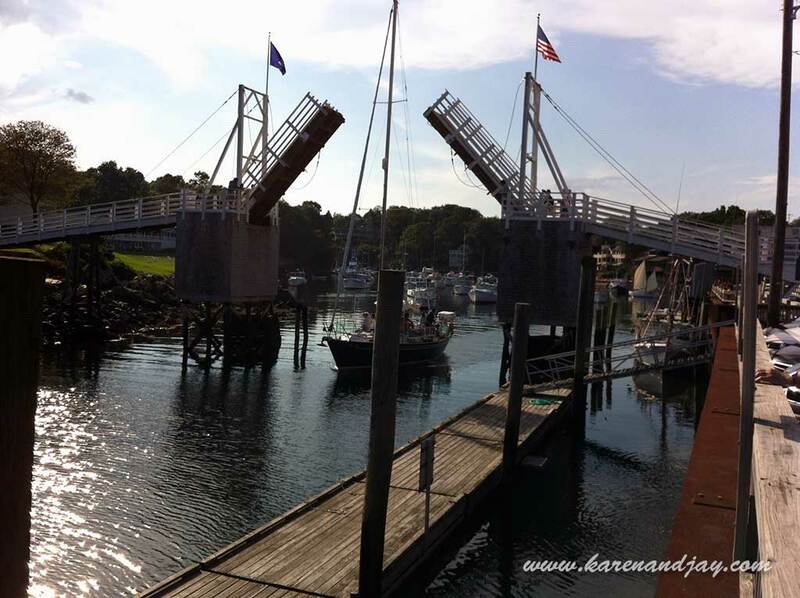 Then we headed up route 1 on a beautiful sunny day. 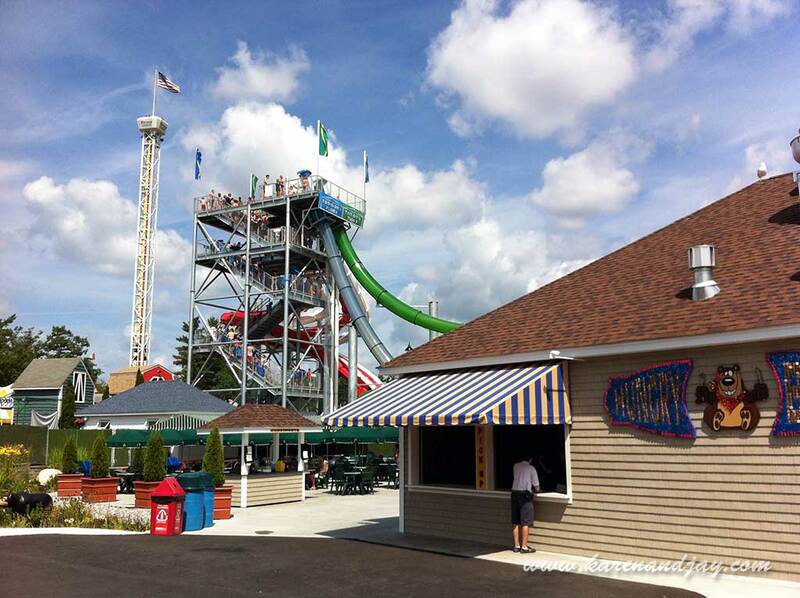 One of the big changes I knew of was the expansion of the Splashtown waterpark. 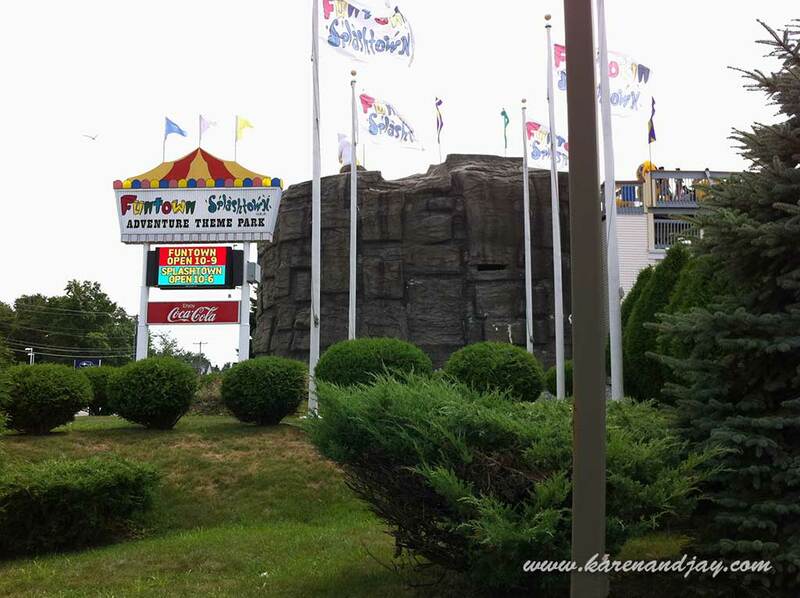 Funtown had an expansive and fun miniature golf course bordering route 1 the last time we were there. 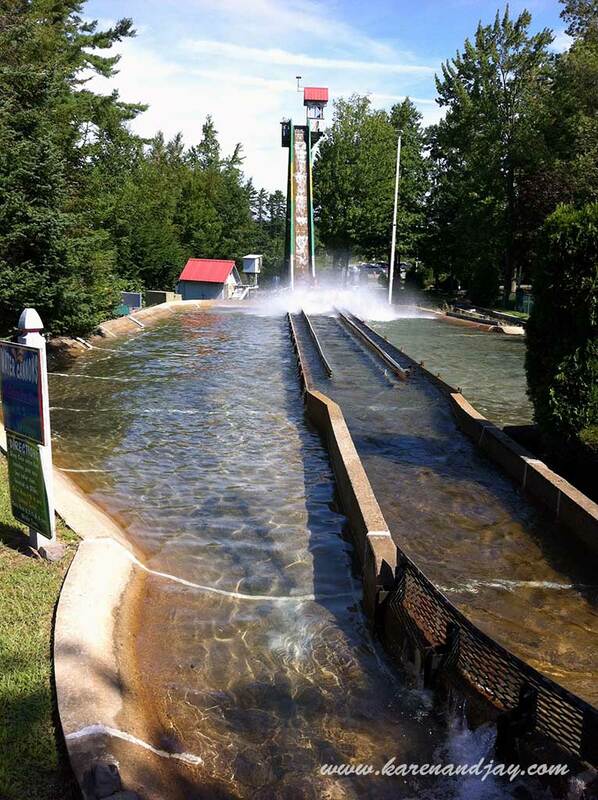 But this time, the waterpark had taken over that entire area. The entrance still had its charm, with a big stone cliff -- topped by a polar bear -- hiding the waterpark. 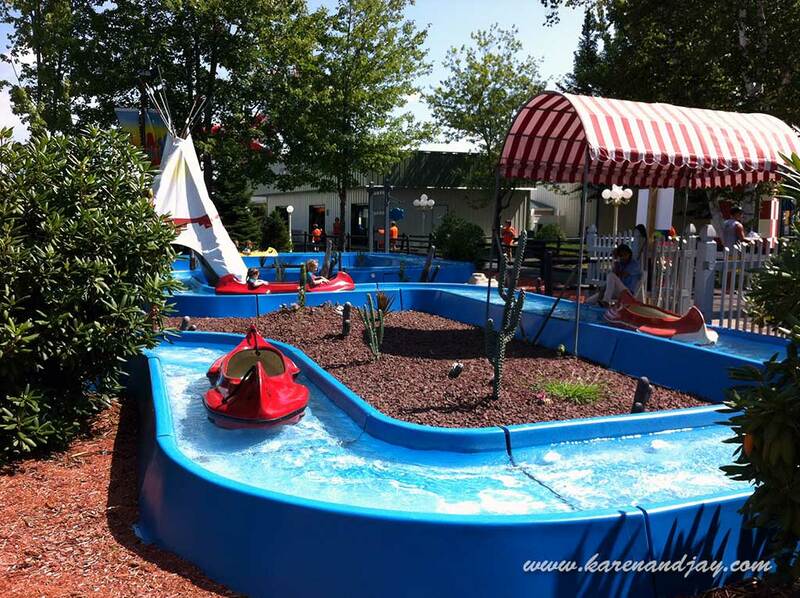 Parking at Funtown was still free, a refreshing change from the big themers. 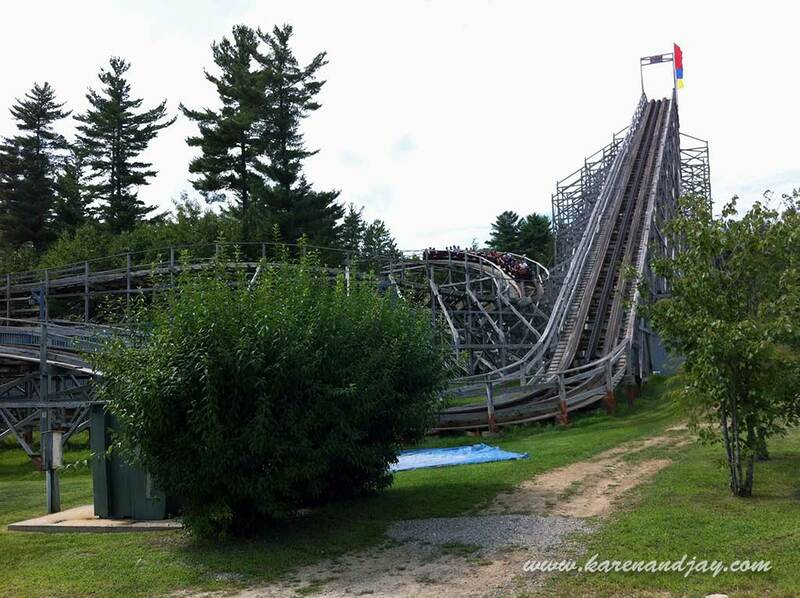 At the back of the parking lot loomed Excalibur, their big viscious wood coaster. The lot was mostly empty. We parked under the shade of a tree at the edge of the lot. Then we made the trek toward the entrance. It was about 10:30 and the park was just opening. The cost for the two of us was $58, which was the cost of a single admission at many other parks. The entrance gate still seemed to be at an awkward spot, at the northeast corner of the park facing the back of the parking lot. There were a lot of people waiting to enter, including some outings. The gates opened and people flowed onto the midway. 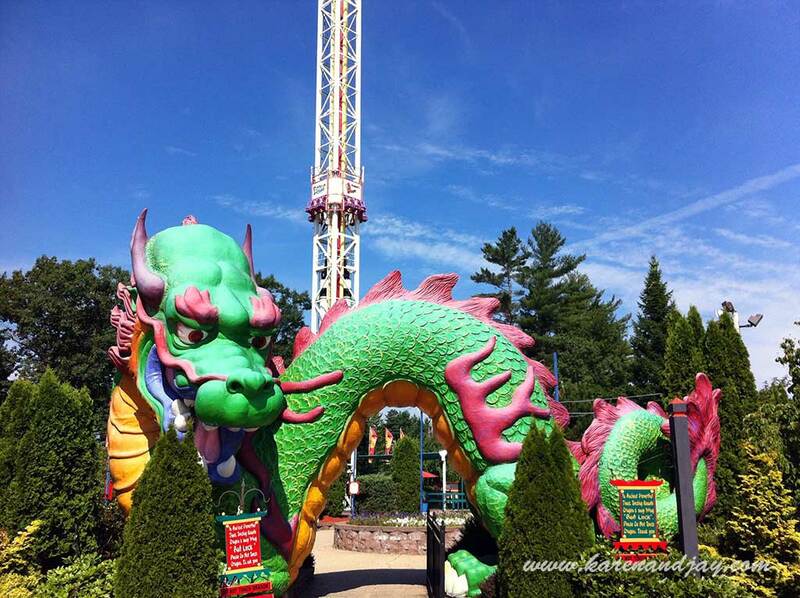 We took a right, walking past the spectacular entrance for Dragon's Descent, the park's drop tower. 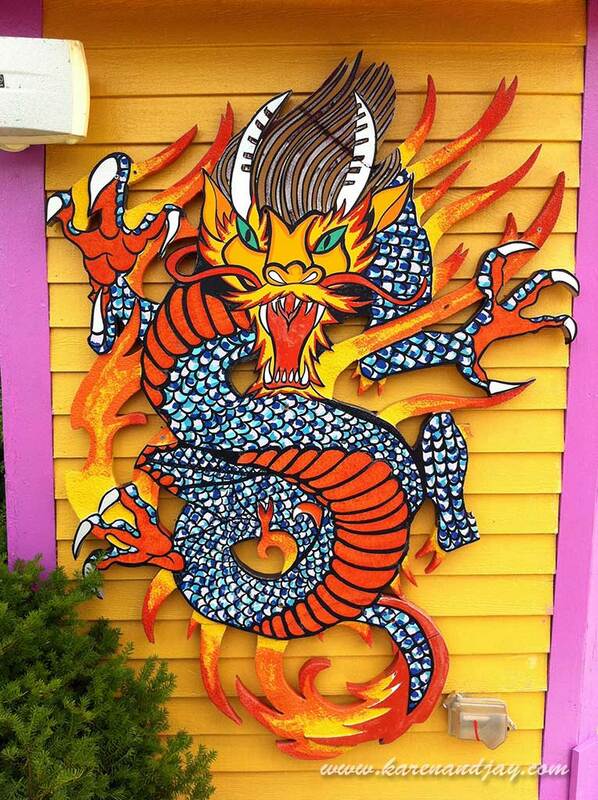 A brightly colored Chinese dragon made an archway between thick shrubs. It was a display worthy of Busch Gardens. 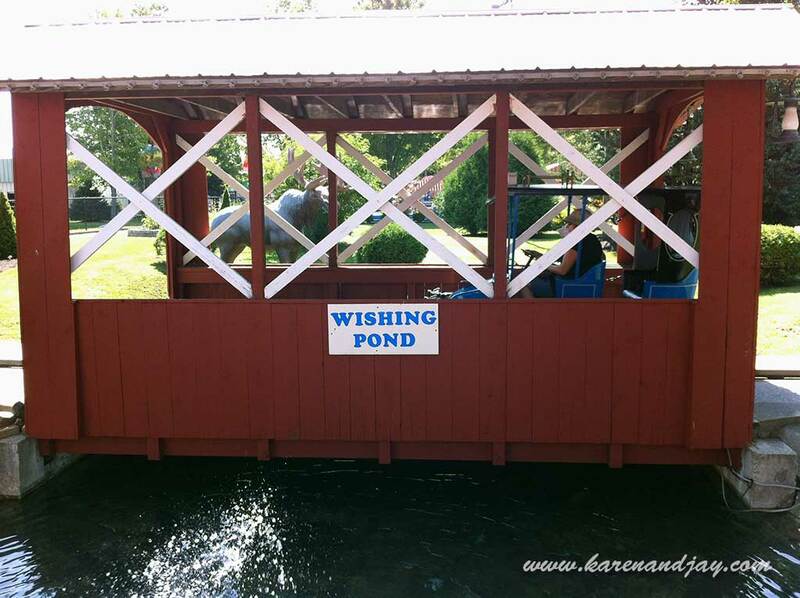 There were beautiful landscaping touches everywhere we looked, from an old-west-themed kiddie canoe ride to a Trabant themed like a roulette wheel to even the signage. There were also many floral displays, again reminding us of a mini Busch Gardens. 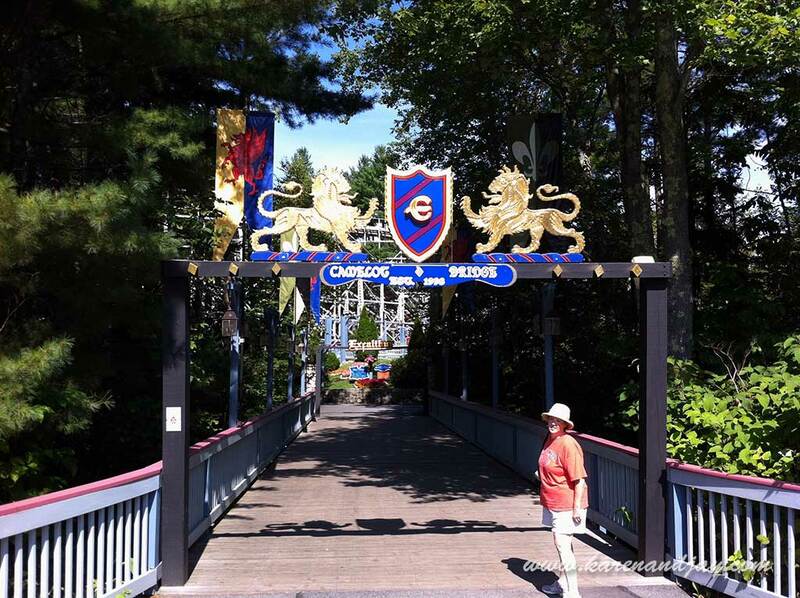 Our first order of business was to head to the back of the park to ride Excalibur. 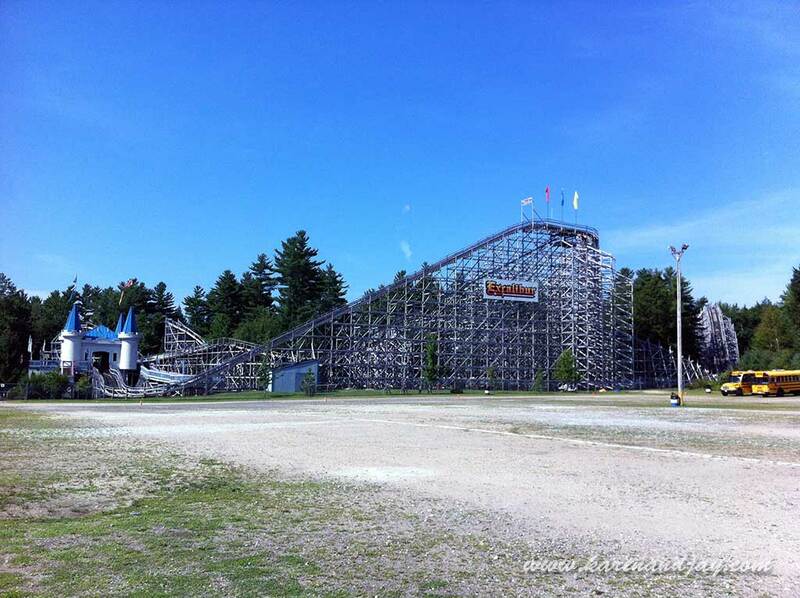 The coaster was 15 years old this season. 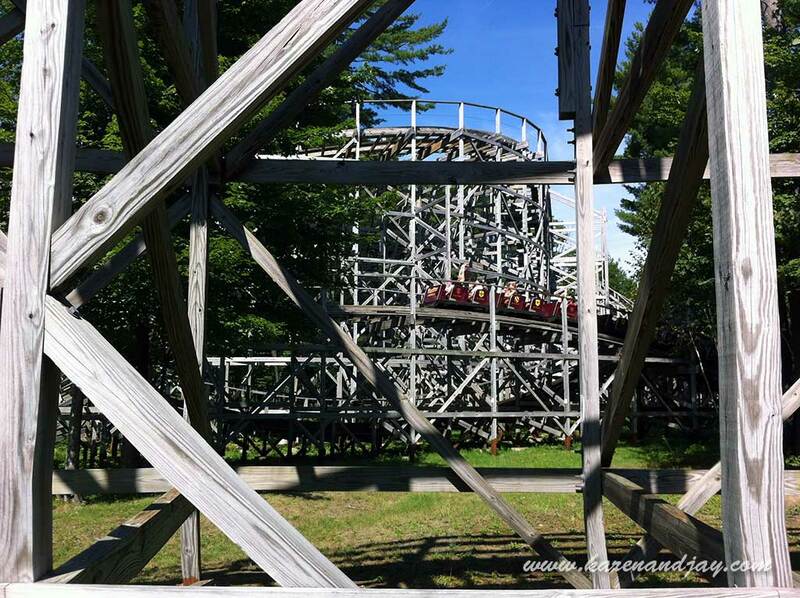 When we rode it on our first visit, it was one of the most disorienting and surprisingly violent wood coasters I'd ever been on. I hadn't expected such a punchy ride in such a pleasant park. and I wondered how it had aged. 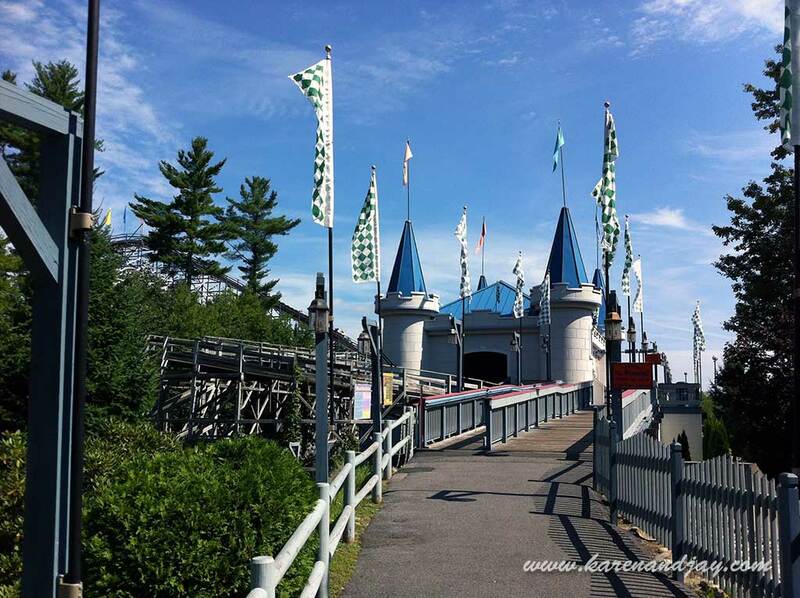 To get to the coaster, we walked over a set of wooden bridges criss-crossing the antique car ride and past Thunder Falls, the nicely landscaped flume ride. This led to the only "themed" area in the park. 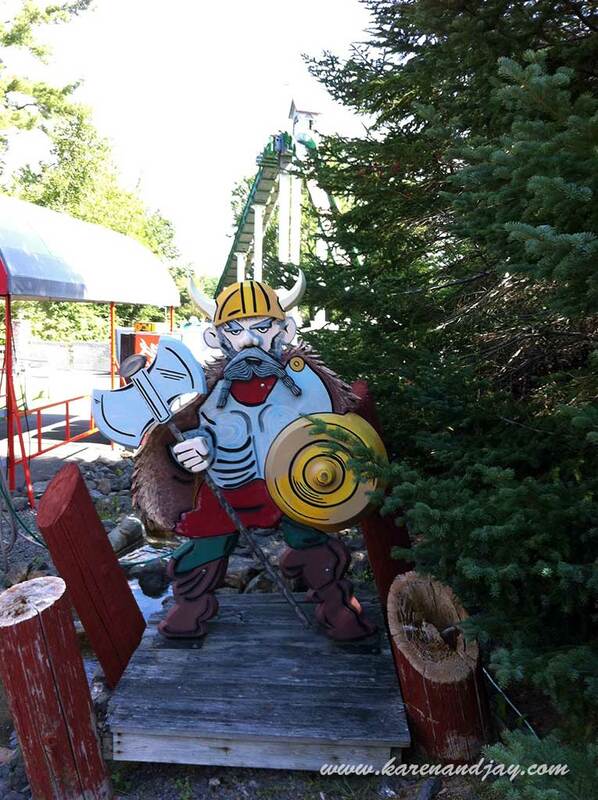 The scenery shifted from sort of viking-themed scenery to Camelot. We passed under some misters, a welcome relief from the blazing sun, and paused at the Camelot Bridge, which led over a small brook to the entrance of Excalibur. To the left was the giant sword Excalibur embedded in a stone. Across the bridge, a path led up and to the right toward a large castle, the coaster's station. It was a pretty impressive sight. The path split into three clearly labeled queues -- one for the back seat, one for the front and one for the observation deck. Naturally, we chose the front. The station interior was decorated with heraldry and two large knights on either side of the exit. Each set of seats in the train was named for one of the twelve Knights of the Round Table. I also liked the dangerous-looking portcullis over each of the station's archways. I was surprised how empty the station was. 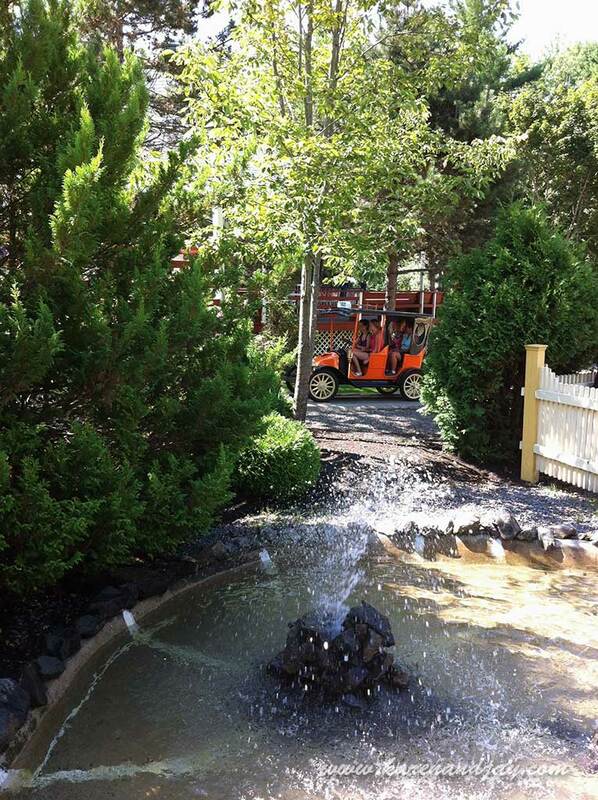 This was the park's major ride, and I would have thought guests would have dashed here first. 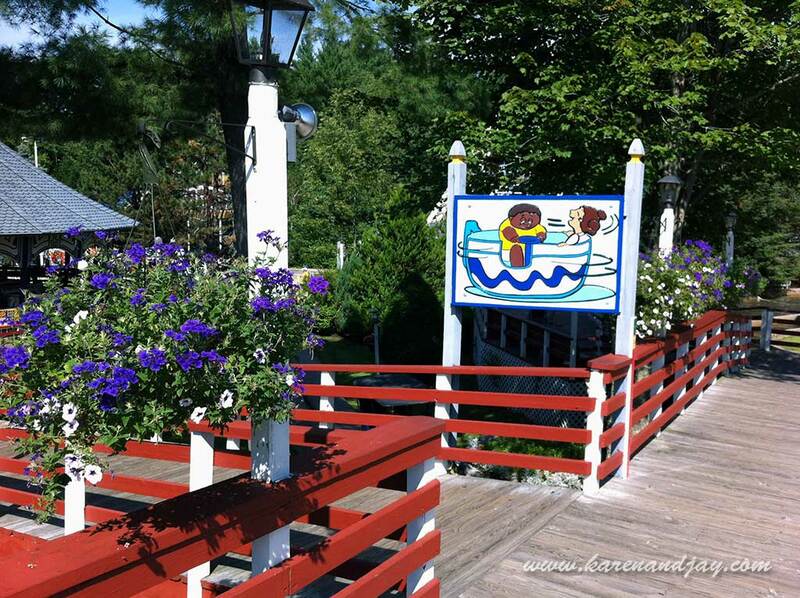 But as Karen correctly surmised, most of the guests instead had headed for the waterpark. Within a few minutes were were seated in the front. The single PTC train had seat dividers and seat belts in addtion to the individual ratcheting lap bars. We rolled straight out of the station for about thirty feet and then took a 90-degree turn left up the lift hill. From there, most of the ride was completely hidden in trees except for the return track. A first-time rider would have no clue about the mayhem that was about to be unleashed. We crested the 100-foot-high lift. The track turned slightly left and dropped out steeply from under us. We blasted down the first drop and rose up into a hill nearly as high as the lift. We popped out of our seats and sped into a right-hand turn. We dove down -- and the rest of the ride was a knotted blur. It was impossible to get our bearings. The ride must have been a killer at night. At least during the day we could anticipate the swift turns through the forest. Every hill popped us out of our seats. Unfortunately, in Karen's case most airtime was followed by a sharp turn that through her hard into the seat divider. She ended up with a large bruise on her thigh. We hit the brakes breathless. The ride still had one more thrill: the brake run made a steep swoop to the left into the station, throwing us to the right one more time. 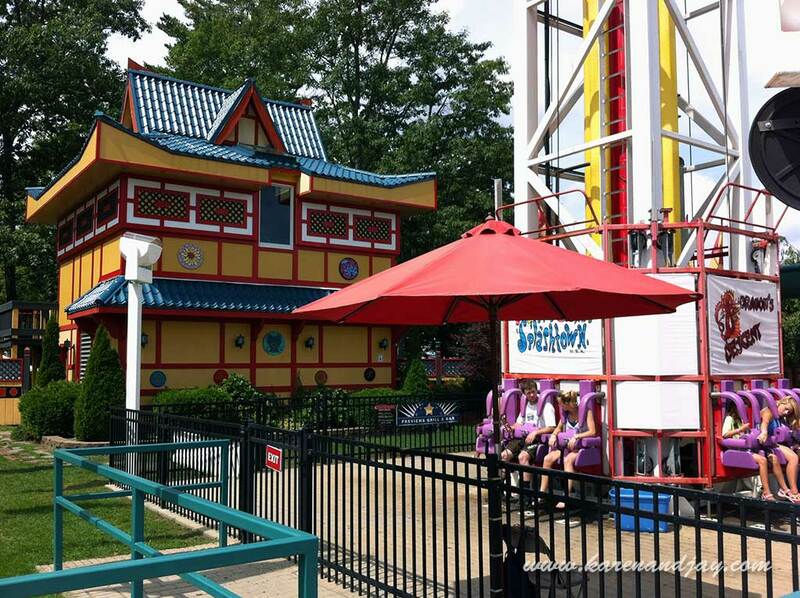 Though violent (and except for Karen's bruise), Excalibur is a great wood coaster with lots of surprising twists and turns and great airtime -- and amazingly, it's relatively smooth. The ending runs out of steam, though. If that stretch had been kept lower to the ground with some well-placed speed bumps, the thrill would have continued right up to the brakes. We were both a bit wiped after that ride, so we headed back to the main midway for some less stressful fun. 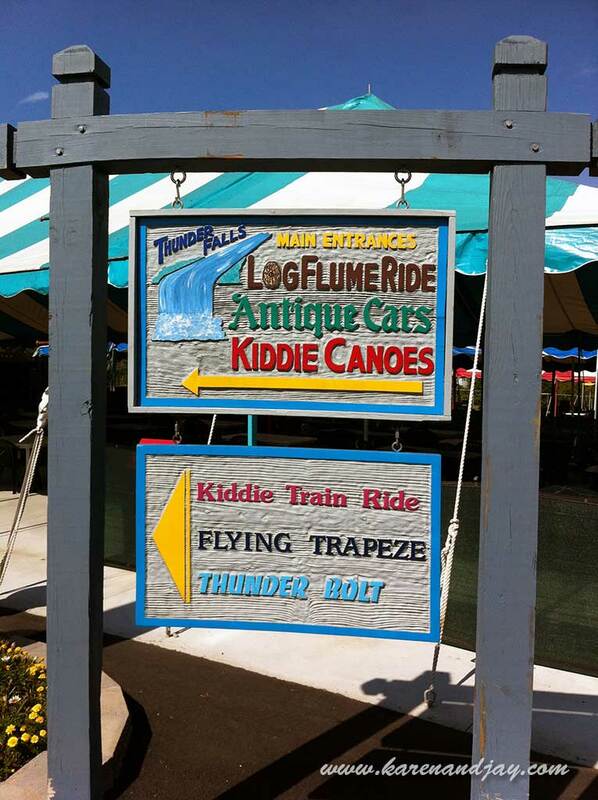 We next queued up for Thunder Falls. The last time we were at the park, the ride's many arbor vitae were being sculpted by a park employee weilding a chainsaw. That didn't make for a relaxing ride. But this time all was quiet. The concrete trough was set into the ground giving the ride an organic look. The water flowed quickly, and the trough took many sharp turns so that the log would bump into a side and then reluctantly turn. Even with the bumping it was a relaxing trip. The final drop was swift and steep, but we came away from it fairly dry. For a quarter, guests could control water cannons at the bottom of the drop but I guess no one was feeling particularly sadistic that day. Nearby was the queue line for the antique car ride. The park had two of them, one near the front and one near the back. This one (the latter) had Model-T-styled vehicles. My recollection of it was that it was a long and relaxing ride. The line was short (unusual for that type of ride) and we were soon on our way. 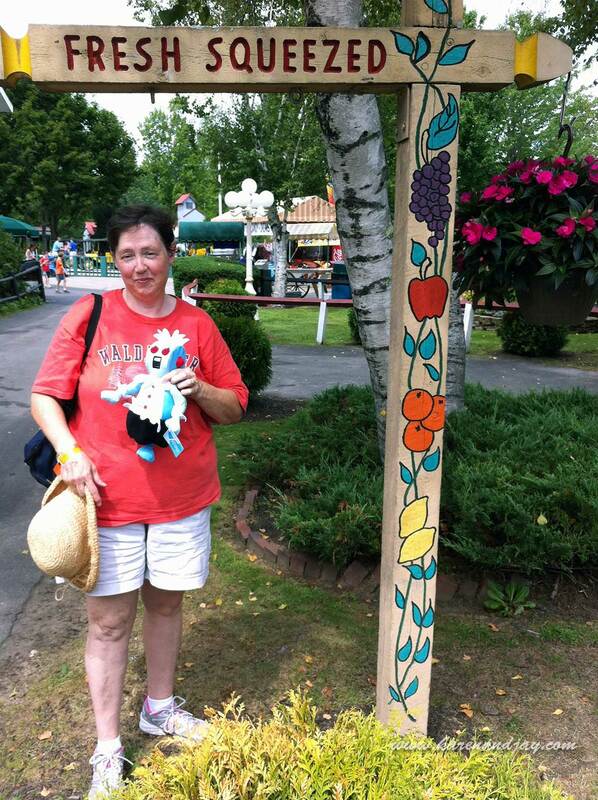 Crossing over a bridge, Karen noticed a large moose statue that used to be on the miniature golf course. We saw several golf course statues placed along the route. I was glad the park found a use for some of their relics. As we rounded a corner at the far end of the ride, the concrete track suddenly looked brand new. We circled around to the right and were back at the station. The park must have modified the track to accomodate something else; I didn't remember the ride being that short. As we walked back over the long bridge to the center section of the park, Karen noticed a train ride tucked away in a corner. We walked over to it. There was no one else around except for the operator, who looked extremely bored. 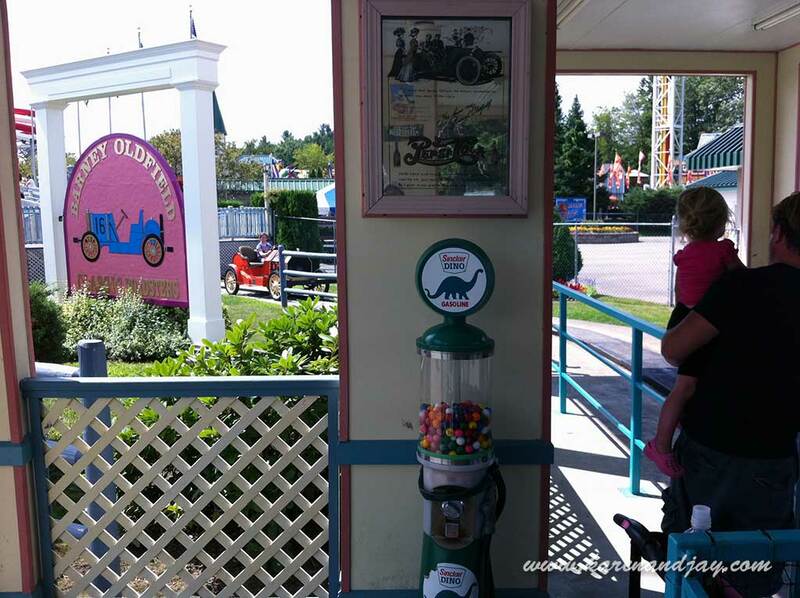 The ride itself was cute, with various small buildings (some from the mini-golf course) scattered along the winding track. 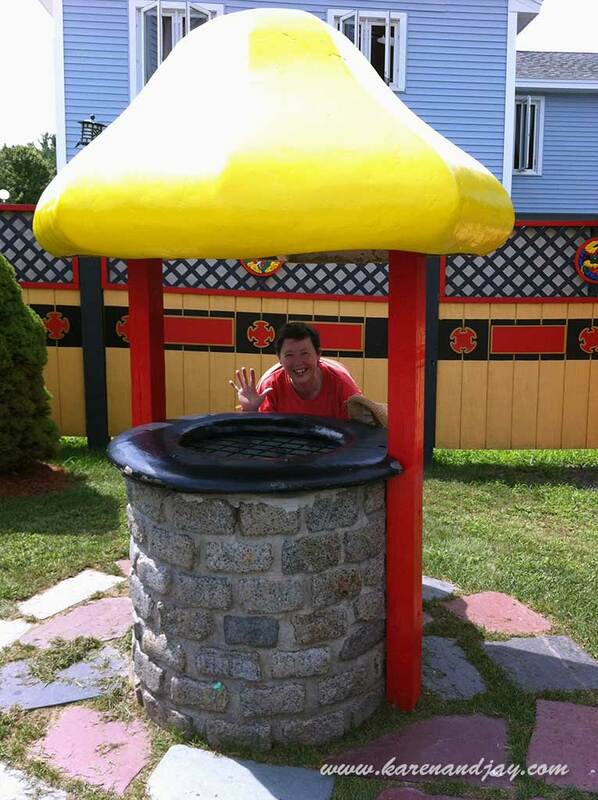 The ride was strictly for small children. 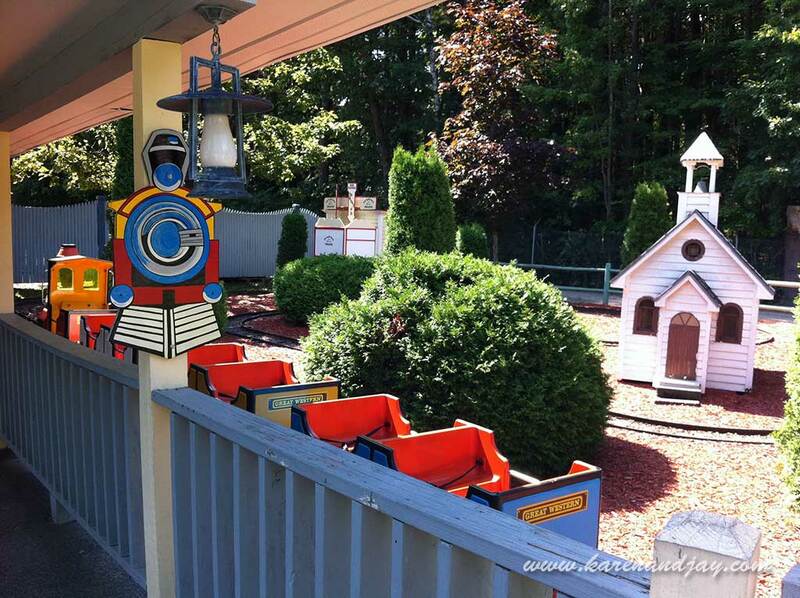 I wished Funtown had a real miniature railroad for both adults and children. From there we walked over to the Mexican food booth (which oddly also served pizza and tuna sandwiches) and got some drinks. Then we headed for the center section of the park. 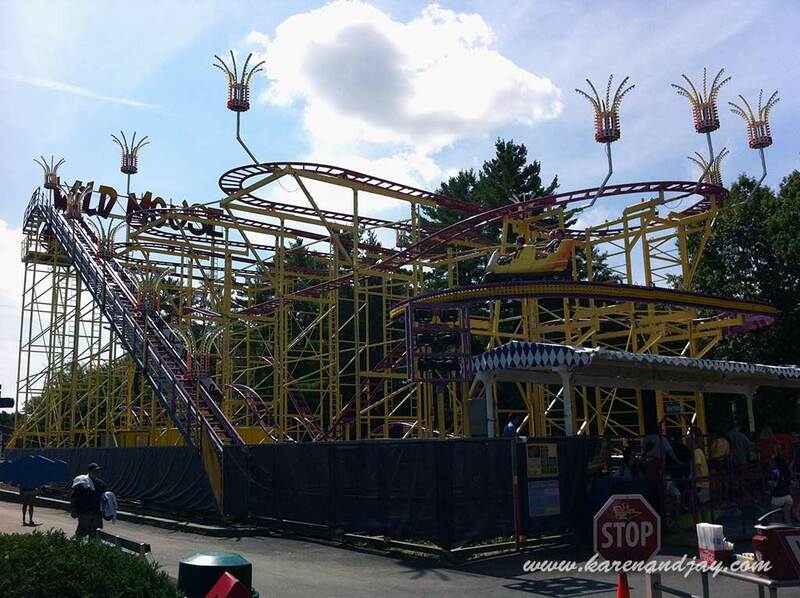 The old Galaxi coaster had been removed and was replaced by a new Wild Mouse. 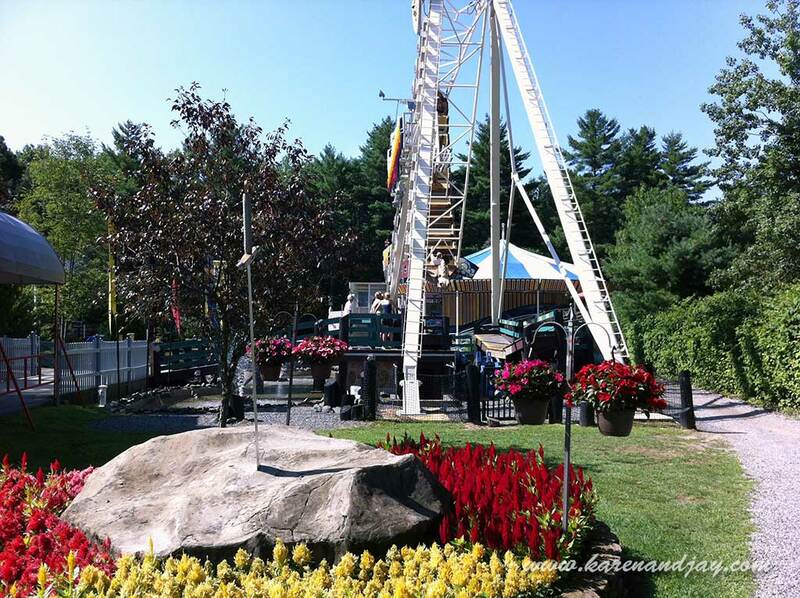 It was a good fit for that area, offering a similarly sized family ride that gave a similar experience. 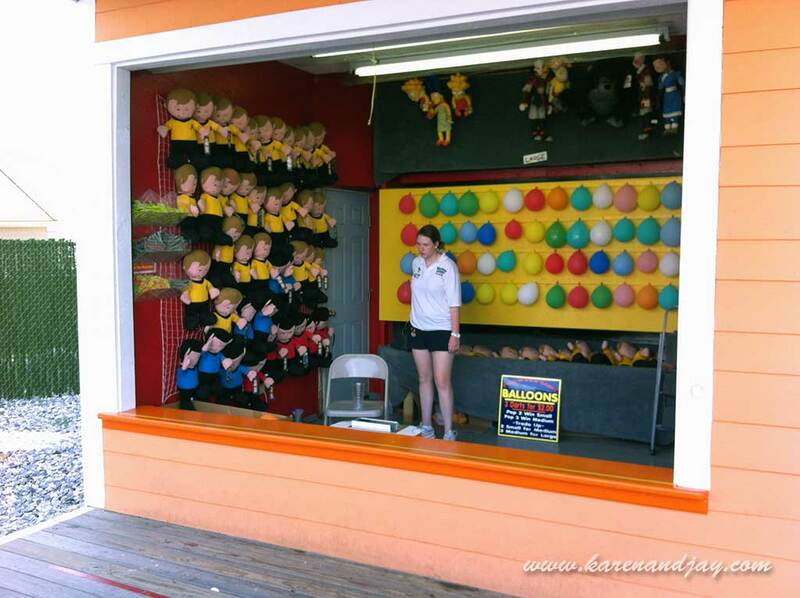 Karen spotted a SkeeBall concession that offered as a prize a little doll of Rosie the Robot from the old cartoon The Jetsons. It was 76 tickets. So we began playing. I seemed to have bad luck with the machines; when I hit 40 points, it only scored 30. When I hit 50 points, it only scored 40. I switched to a different machine but had the same problems. The attendant was friendly and helpful and marked the machines "Out of Order". We amassed about 35 tickets after twenty minutes of playing. We took a break and moved on. Heritage Gifts offered air conditioning, so we walked in. The little shop was filled with glistening crystals, mirrors, wind chimes -- all sorts of pretty trinkets. There were very few gifts specific to the park. Karen saw a stunning circular mirror rimmed with multicolored glass shards. We made a mental note of it. The central area near the front of the park, just behind Splashtown, seemed like a work in progress. The last time we were there, the area featured a pizza shop, a patio with tables and a candy shop up on the second floor of a colorful building. 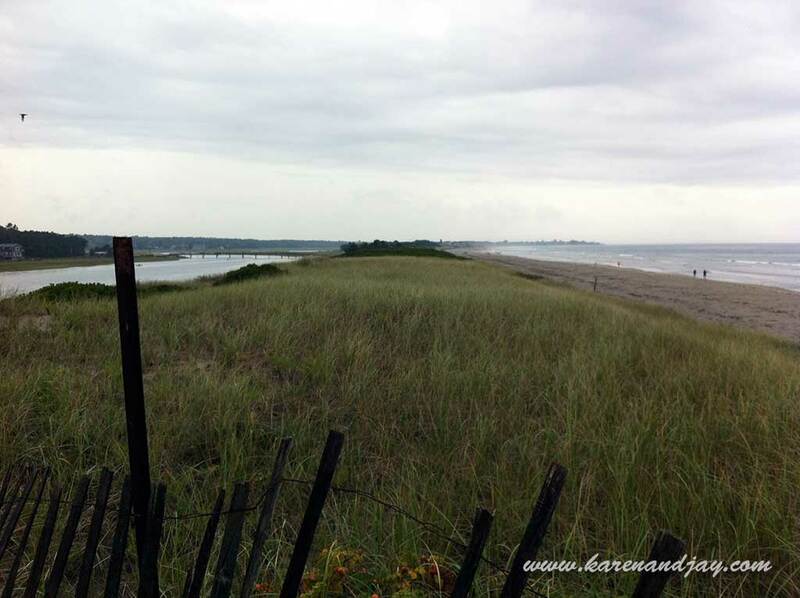 Most of those features were retained, but they were separated by a huge expanse of asphalt. 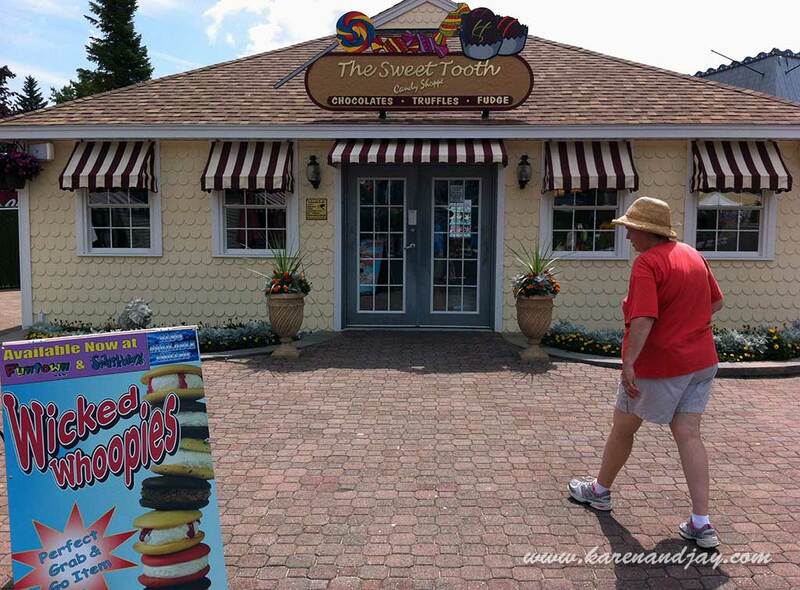 The candy shop was now a smaller new single-level building. The pizza shop was now "The Hungry Bear." 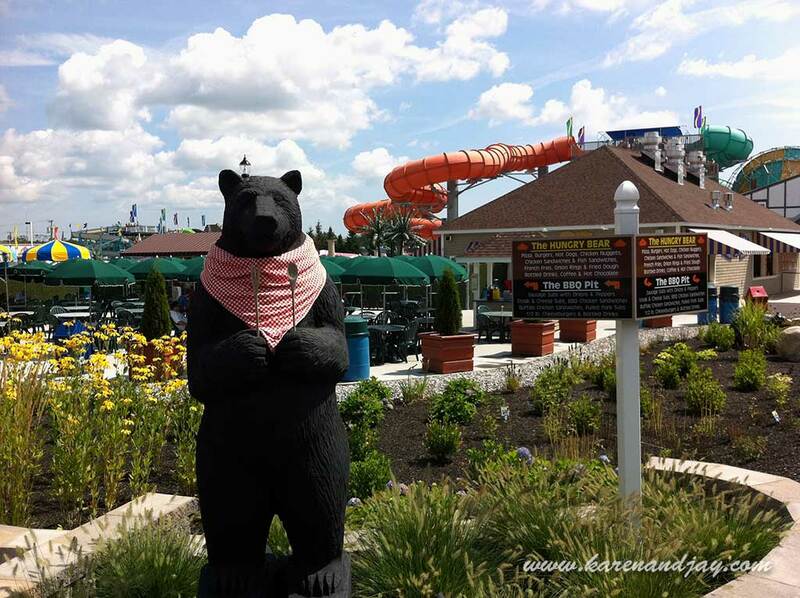 The patio had been moved to an area tucked away between Splashtown and the Hungry Bear. To the left was a large landscaped area featuring a wooden bear holding a spoon and fork. The landscaping wasn't particularly impressive (brown mulch with tufts of greenery), and it seemed out-of-place. I wish it had been in the center of the large asphalt expanse, to give more visual variety to that area. But perhaps the park had other plans for that space. We stopped into the Sweet Tooth (the candy shop). The old shop had been lined with pictures of Disney characters, probably to appeal to kids. But this one was more austere with a black-and-white checkerboard floor and racks of all sorts of candy. I bought a tasty confection of white chocolate, cashews and caramel. Karen got some dark chocolate. We sat under an umbrella on the patio and ate. 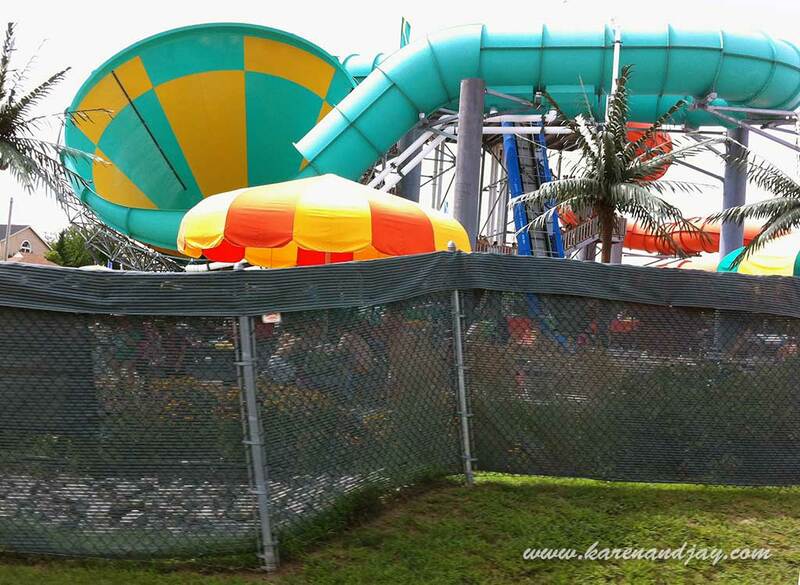 There wasn't much to see from our vantage point: lots of asphalt and a large green fence that separated us from the waterpark. We then headed for the last section of the park we hadn't explored. 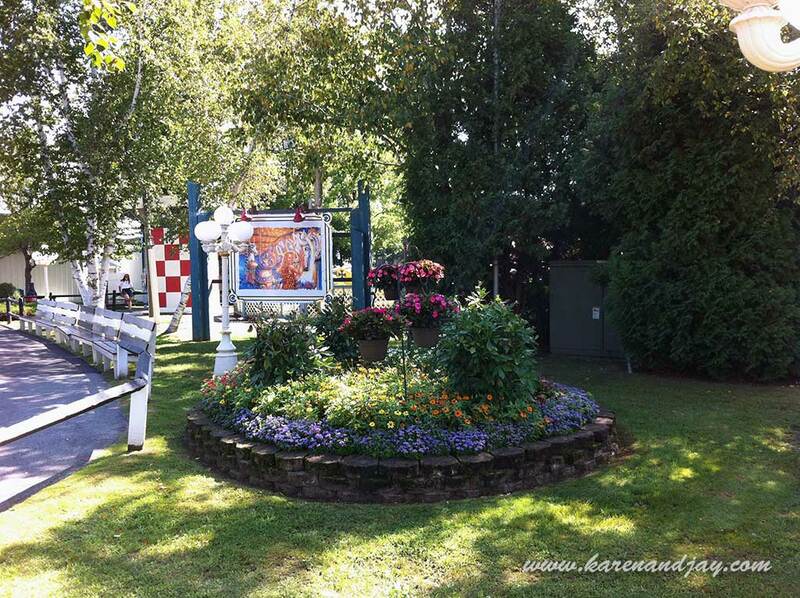 On the way, we passed by more colorful floral displays and Karen noticed a dart game with odd prizes of stuffed Star Trek characters. 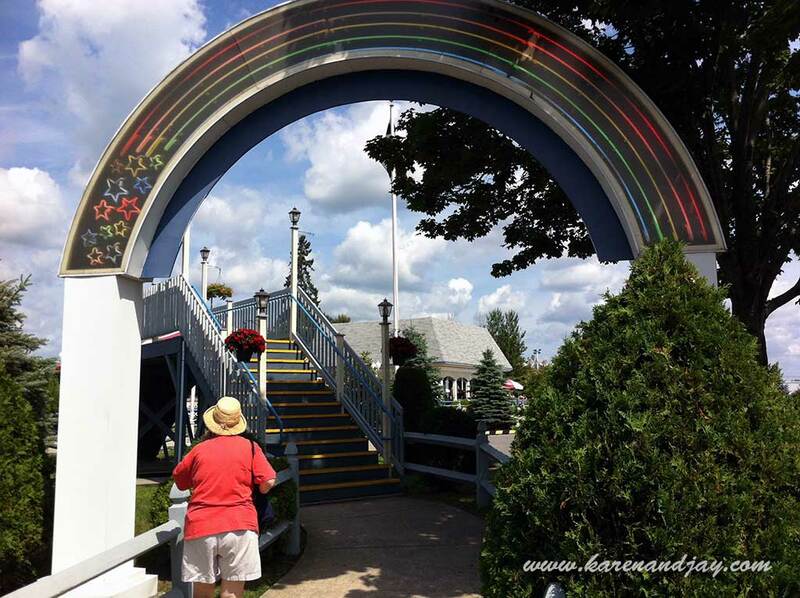 The entrance to the north section of the park was through a neon rainbow arch, which must have looked spectacular at night, and up over a wooden bridge that spanned the Barney Oldfield Roadsters, the park's other antique car ride. Grand Prix Racers, the large go-cart track next to it, seemed to be busy. Since the Roadsters didn't have much of a line, we queued up for it. 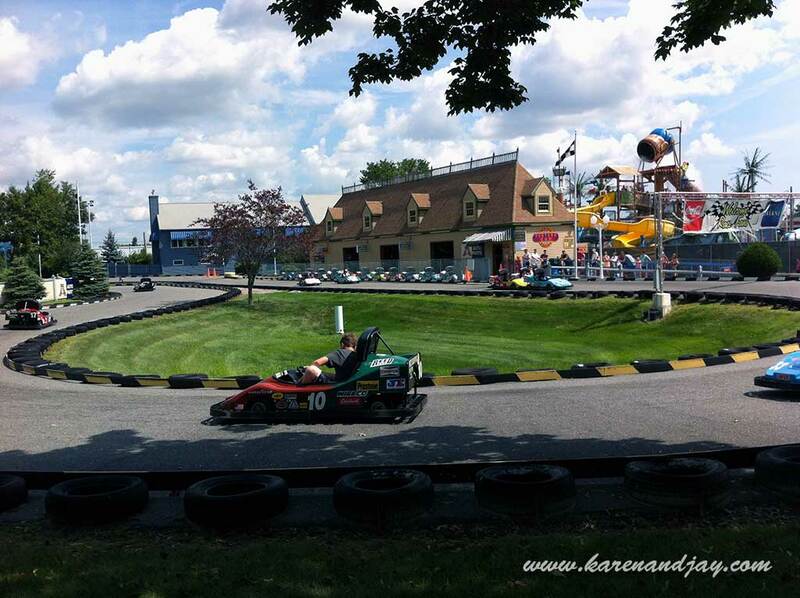 The cars looked like 1920s sports cars (appropriate, next to a go-cart track). 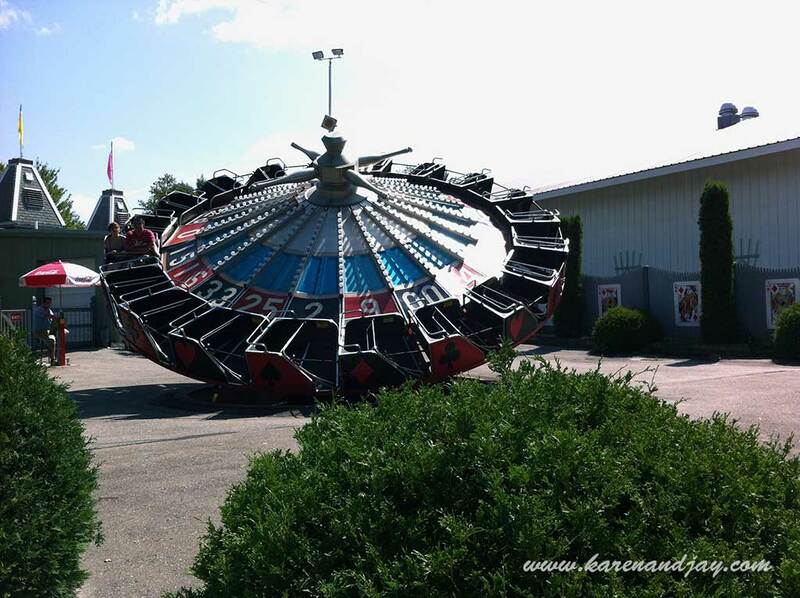 But the ride itself was really short. The only unique section was at the end where the track went under the entrance bridge. On either side were the bridge ramps, which were lined on their sides with wood lattice creating a sort of tunnel. 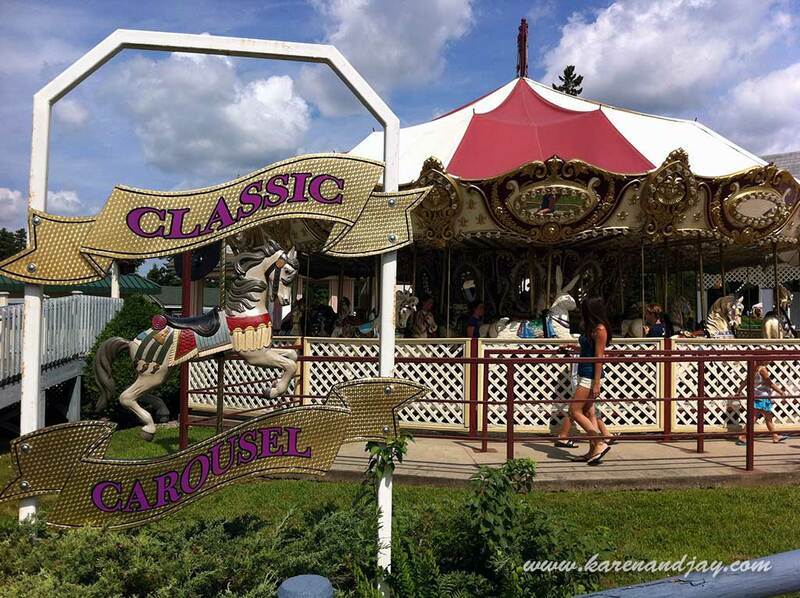 We could hear really strange noises next door, so we strolled over to the Classic Carousel, a small fiberglass menagerie model. 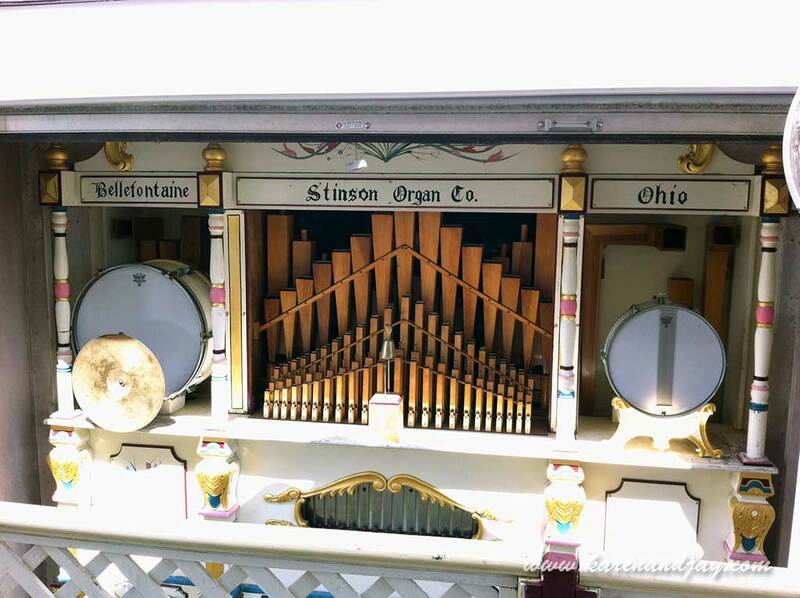 To the park's credit, they did have a real Stinson band organ in its own little building outside of the ride. But the sounds it was making were not from this planet. Karen and I just stood there open-mouthed. The organ would emit bursts of blurps and bleeps. Its triangle would ding intermittently. It was so pathetic, we burst out laughing. We took a ride almost out of sympathy. I asked the operator about the organ. He said it was working fine until about a week ago when the maintenance crew changed the rolls. Having worked on the Holyoke Merry-Go-Round band organ for so many years, I figured they hadn't lined up the rolls properly; the Stinson was probably mistracking. We walked over to the small cul-de-sac where the Dragon's Descent stood. That was probably the most colorful and well-themed area of the park. Karen paused to pose by a small artifical well. Nearby in the huge picnic tent, a large group of kids from an outing was taking a lunch break. 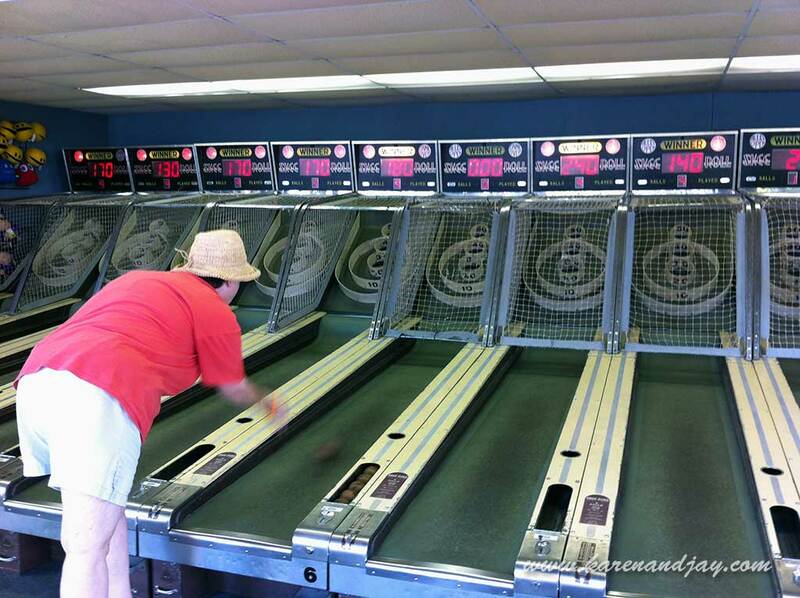 From there we went back to the SkeeBall game and played until we had amassed the 76 tickets we needed. After another 20 minutes of playing, we reached our goal. Karen won her little Rosie doll. 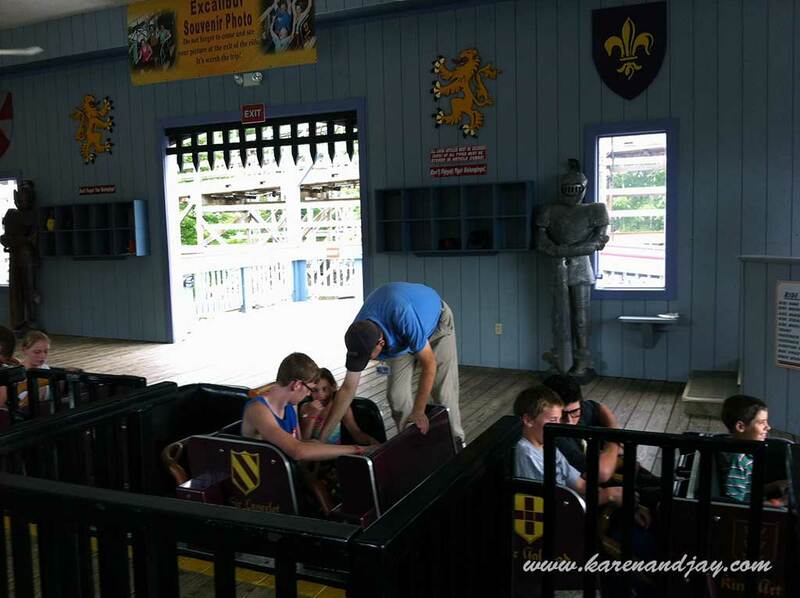 Then we made another trip to the back of the park for one more ride on Excalibur. Karen was hesitant at first, but braved another circuit. I was surprised that there still were hardly any people in line. 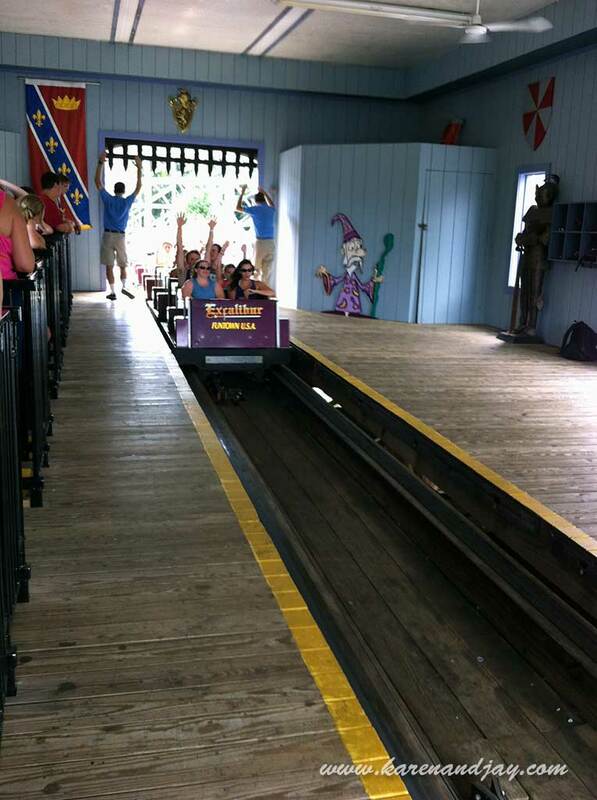 Perhaps, with so many other gentle amusements at the park, Excalibur was just too intense for most of the guests. This time the train flew even faster and Karen slammed even harder into the seat divider. (In my experience, seat dividers on coasters always cause more trouble than they're worth.) On the way out, I bought a silly on-ride photo. We stopped into the little Excalibur gift shop. I already had a spectacular t-shirt from our last visit (which I wore to the park), and was hoping they had an equally impressive new one. But they didn't. So I bought a magnet and a patch instead. We returned to Heritage Gifts to get that colorful mirror and a pretty wind chime. And that ended our stay at Funtown. We had a good time, though to me the park lost a bit of its character when it removed the mini-golf course. Although I understood the popularity of the waterpark, the expansion had made that area look more industrial. I preferred the quirky charm we saw on our first visit. 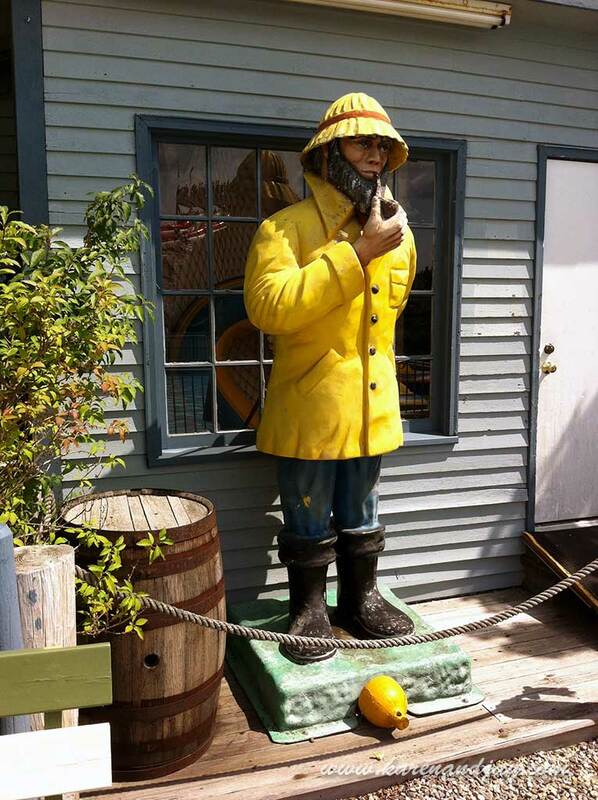 I was glad they had saved some of the unique statues from the course. But I hoped as they continue to grow they retain that uniqueness and charm -- and trees. By the time we left, the park was bustling. That kind of popularity means they must be doing something right. 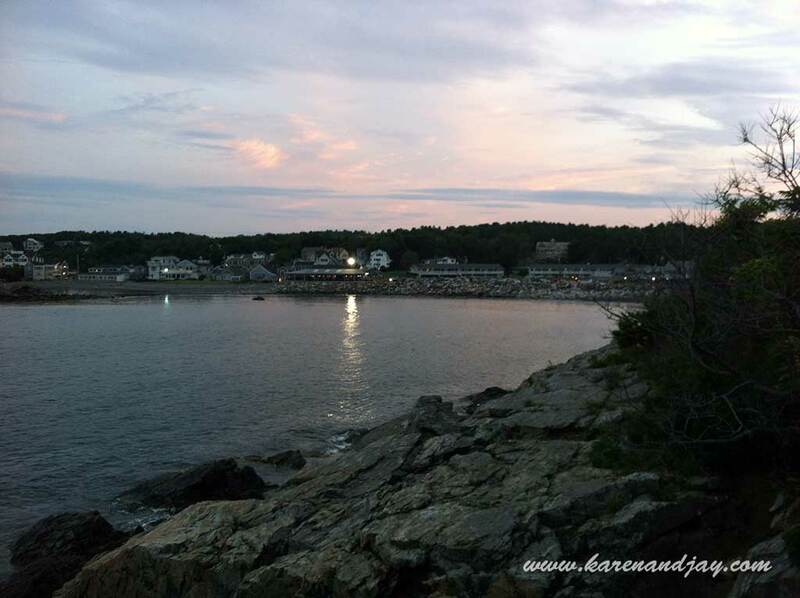 Karen and I drove back for Ogunquit and spent the late afternoon relaxing on the beach, a peaceful end to an enjoyable day in Maine.